In his message entitled, ‘Find out the truth’, Wise Man Harry referred the congregation to excerpts from the Bible to make his case, underscoring John 7:11-18 as the proof text. In Thessalonians 5:21 we are advised to test everything and hold fast to the truth. Jesus is the truth. He speaks the truth; He is not out to confuse us. To know the truth is to know Jesus. As soon as the message was over, Prophet T.B. Joshua re-echoed the potency of the new Anointing Water and that immediately attracted testimonies by those who received it in the previous service. 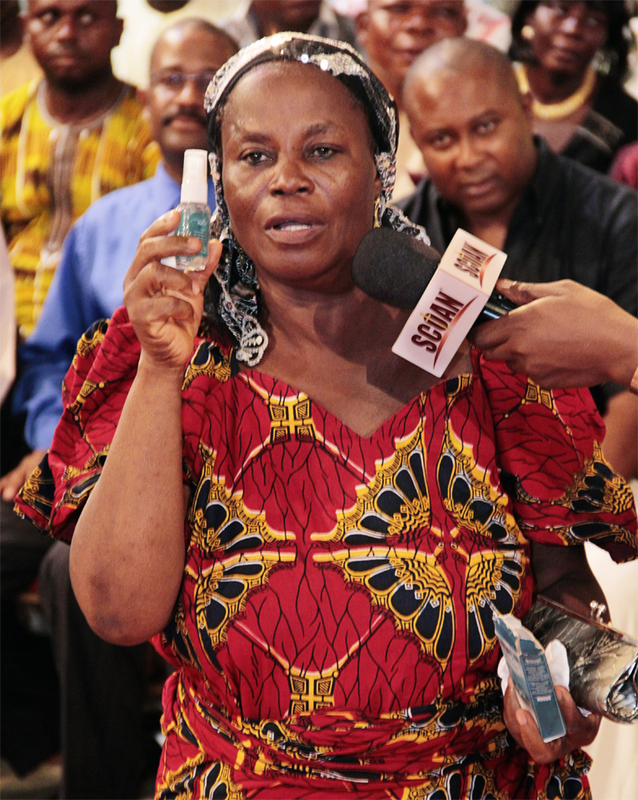 The first among them, Madam Patience from Sokoto who had suffered from diabetes for nine years, said that after receiving the new Anointing Water, she prayed over it and administered it as instructed. She went to bed for the night rest after administering it. According to her, she slept peacefully like a baby and woke up hale, hearty and strong. She was more or less recreated during her sleep and all the infirmities and aches which used to be part and parcel of her frame gave way for the freshness and agility brought about by the new Anointing Water. She used to urinate four or five times in the night but after administering the new Anointing Water, she urinated only once. At present, she hardly remembers whether she urinates at all in the day. She stopped all her medication for the week without sensing any adverse effects on herself. In her unmistakeable joy, she christened the Anointing Water, ‘The father of fathers’ and thanked God profusely for her miraculous healing. Emmanuel from Rivers State mounted the platform for his testimony. According to him, he had been jobless for the past two years but the miracle in his life came after he had administered the Anointing Water. The contract he had applied for and been waiting for the past two years was miraculously approved. Displaying the contract agreement papers as he gave his testimony, he informed the congregation that it was an N18,000,000.00 contract. He thanked God and Prophet T.B. Joshua for the wonderful opportunity to transform his life brought about through the medium of the Anointing Water. 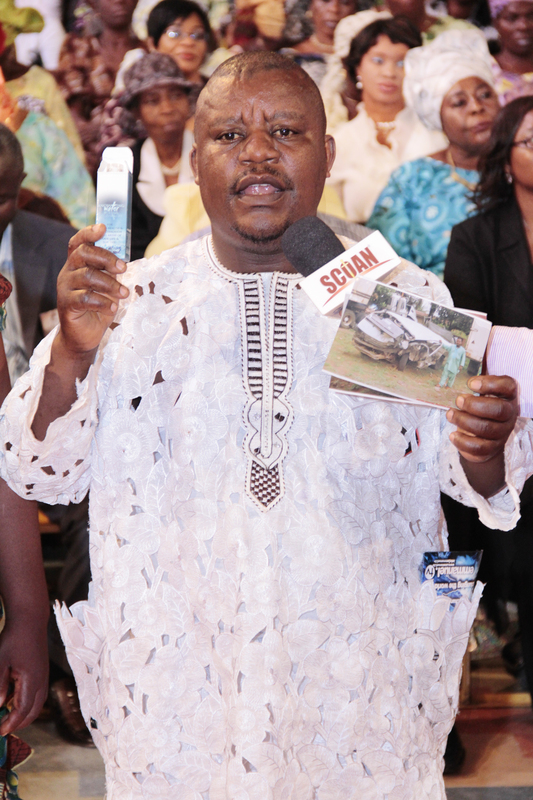 Christopher from Delta State was one of those who received the new Anointing Water. He always prayed with it and sprayed it on his family and himself. On the fateful day of testimony, he watched Emmanuel TV and was struck by the phrase, ‘Stop satan from killing and stealing’, which made him touch the screen in faith. After work the same day, he decided to travel to his village. He travelled in a commercial bus which unfortunately was involved in a head-on collision with another vehicle. This caused his vehicle to somersault a number of times. Ten people died in the bus but luckily for Christopher, he was tossed from the seat behind the driver which he had taken, to the boot of the bus where he saw himself in a flat posture. He lay alive, hale, hearty and without any injury all because of the new Anointing Water which was his celebrated antidote. The other vehicle also recorded some deaths as a result of the accident. Thanking God for his safety, he aptly remarked that but for the new Anointing Water, he would have been in the mortuary. We join him indeed in thanking God for the new Anointing Water which veered his path from the mortuary. Priscilla from Ghana also mounted the rostrum for a testimony in praise of the new Anointing Water. Her problem had been bedwetting for which reason she had been to many places in her desperation for a cure but all to no avail. 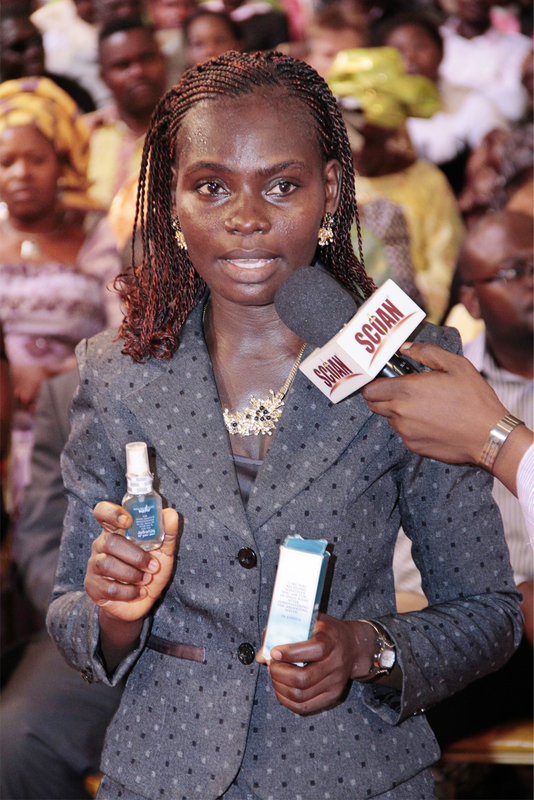 As soon as she heard of the new Anointing Water, she and her husband came to The SCOAN where she received a vial of the new Anointing Water. She applied it after prayer as instructed and her bedwetting promptly stopped. The problem of many years was wiped away without effort by the new Anointing water. Priscilla and her husband thanked God profusely for her miraculous healing. Miss Ozidzor Jay from Ghana had the problem of ankle shift in January. In February, a friend brought her the new Anointing Wristband from The SCOAN. She apparently undermined it and kept it somewhere until the prophet’s voice from Emmanuel TV told her that she had the solution to her problem but she kept on complaining. In reaction, she immediately brought out her Anointing Wristband and wore one on her ankle and the other on her wrist. The result was immediate and miraculous healing. She was among those who celebrated automatic healing on the platform. Christaline Vekabiart from Namibia has put in place an NGO which goes by the name Mount Sinai Centre. The NGO cares for HIV patients and the needy. Her NGO takes care of the needy and children of those who are HIV infected. They take it as their duty to supply the children of the HIV patients with milk as a way of shielding them from HIV infection which they would get from their biological parents through breast feeding. Finding it difficult to keep up with the pace of demands owing to dwindling fortunes, Christaline appealed to the man of God for prayer in this regard through her sister-in-law who was visiting The SCOAN on a Friday. On Saturday night, Christaline had a dream in which the man of God laid hands on her and prayed for her. The result was that soon after that, they got a donation of $100,000.00. With this generous donation, they became better placed for effectiveness in their mission. 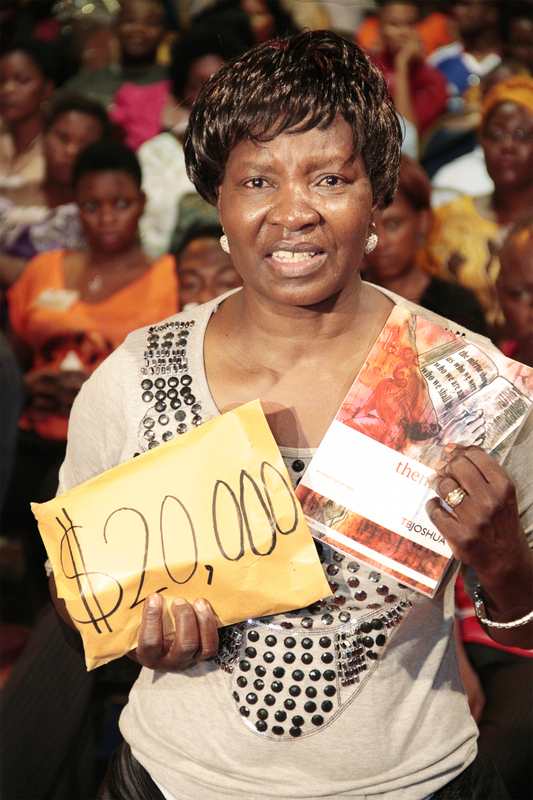 This good news spurred the man of God who added twenty thousand dollars to their funds. Christaline thanked God for His love and mercy advising that as children of God, we should led love lead. About the time for the prayer line, the man of God, to lift people’s faith up, caused a video clip of Christian Amadi to be activated. 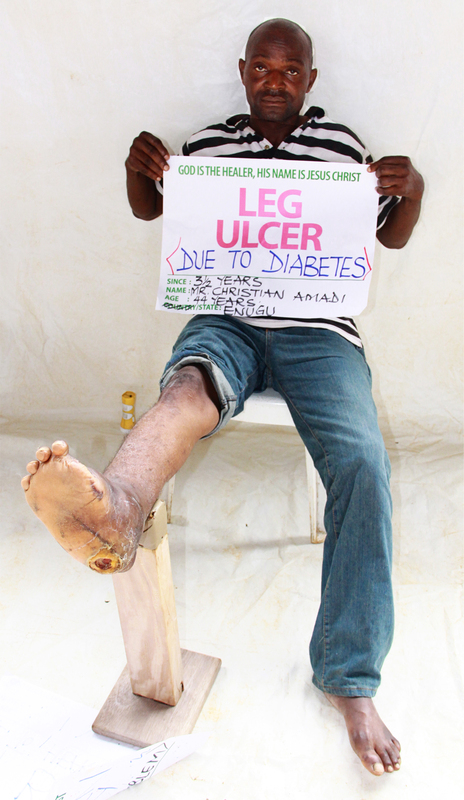 A diabetic patient at the beginning, Christian was unfortunate to develop an ulcer in his foot. The ulcer did a lot of damage to his foot, causing it to rotten and disfigure with puss and festered flesh. It was at that stage that he came for prayer in The Synagogue, Church Of All Nations and Wise Man Daniel prayed for him at the prayer line. Now, Christian is completely healed and came forward to confirm the healing. 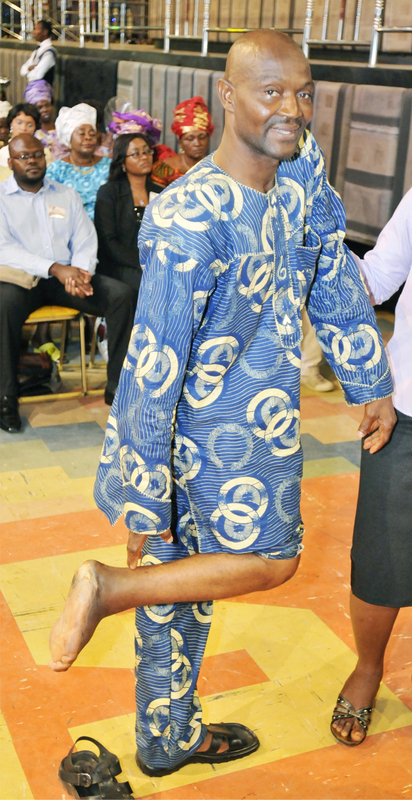 He joyously stamped the foot on the ground and touched it to demonstrate the miraculous work of God. His case was good enough to give patients of ulcer in the prayer line hope as truly, our problems do not embarrass God because He has all the solutions. 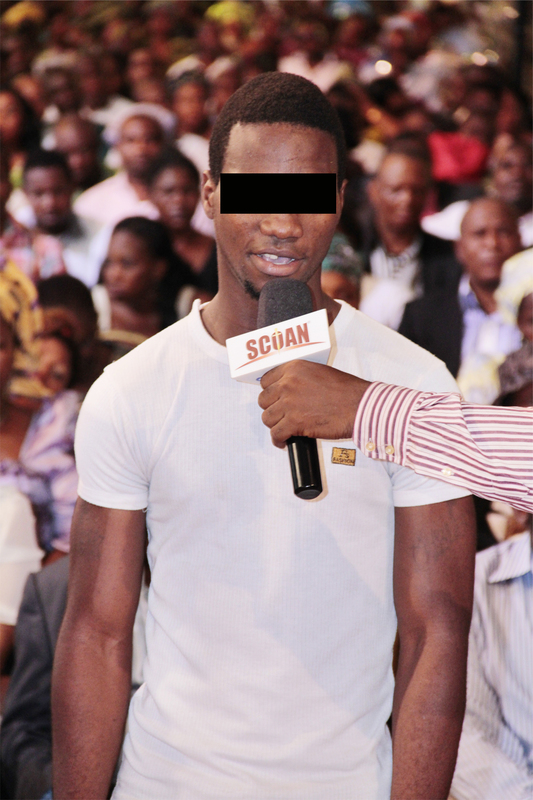 Chidi, the international armed robber who vomited an egg some three weeks before in course of the mass prayer and who finally was delivered from the spirits of destruction, killing and stealing, was asked by the man of God to go home to bring his parents as part of his final integration into society after he had been counselled and fed with the Word of the Lord in the church. It is to be recalled that Chidi and his gang of armed robbers had called at The SCOAN as they went to the eastern part of the country to assassinate a pastor. They met their waterloo in the scheme and Chidi was the only survivor in the gang. As he called at the church again to wreak vengeance on the prophet suspected by him to be the cause of their failed mission, he was arrested in the church by the Holy Spirit. Chidi fetched his father whom he had not seen for six years as he was fully involved in his life of robbery and human wastage. The father, Michael Odeh, accompanied the son to the church after his full explanation of T.B. Joshua’s wish to see members of the family. The mother however, never came because of her disbelief in her son, Chidi. The father recounted the suffering he had been through in the hands of those his son had wronged. He however thanked God for using Prophet T.B. Joshua to recover his son from bad ways into a decent lifestyle. The prophet gave Chidi the sum of N200,000.00 and five bags of rice in addition to a scholarship if he was interested in furthering his education. The next rescued criminal is one Emmanuel Ogbonnah who at a stage in his life of hooliganism wanted to use his parents for a money ritual. Lured to the church by the happenings he watched on Emmanuel TV, he decided to have a personal experience of the church by attending a Sunday service in the church. He too had been arrested in the church by the Holy Spirit and had been hosted for about three weeks in the church during which time he enjoyed a diet of Biblical instruction and related lessons. He too was sent home to his parents to invite them to come and be part of the ceremony of his reintegration in society after being certified free from criminal intentions and capable of contributing to the growth and safety of the same society. 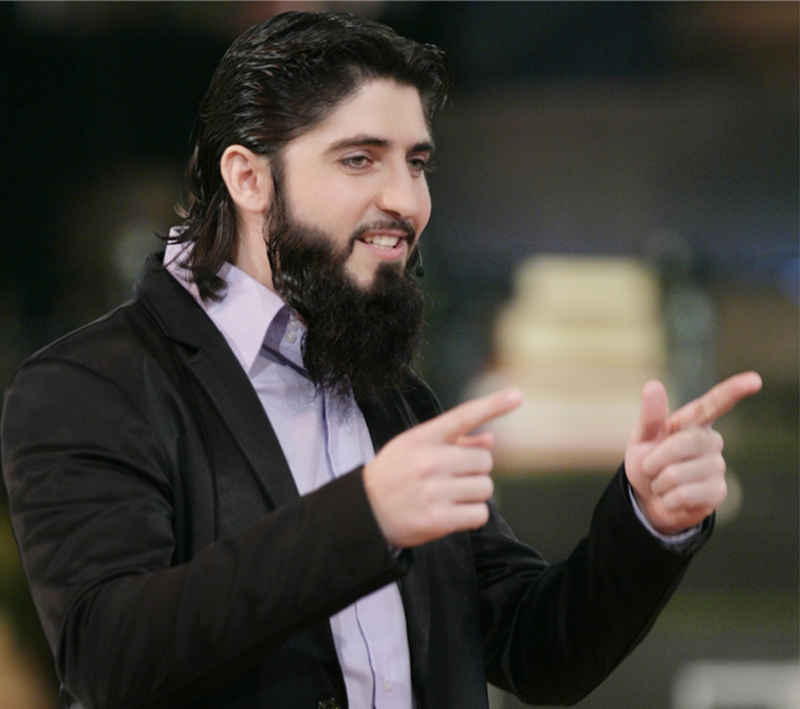 His mother and sister who had lost contact with him for three years accompanied him to The SCOAN in response to the prophet’s invitation after the initial fear and hesitation. According to the mother, Emmanuel went out of control at the death of his father in 1995 to take to robbery. The mother, Mary Ogbonah by name, disclosed that Emmanuel was the sixth out of eight children they had in their marriage. The sister added that after the death of their father, their relations who should help them to restrain Emmanuel from evil ways abandoned them to their fate. Emmanuel knelt down in apology to his mother and sister as enjoined by the man of God for the bad life he had lived in the past and the pain that had been to the family. In his own testimony, Emmanuel disclosed how humane and people friendly he had become after his deliverance. Before he was delivered, he used to see human beings like animals that could be killed at will. 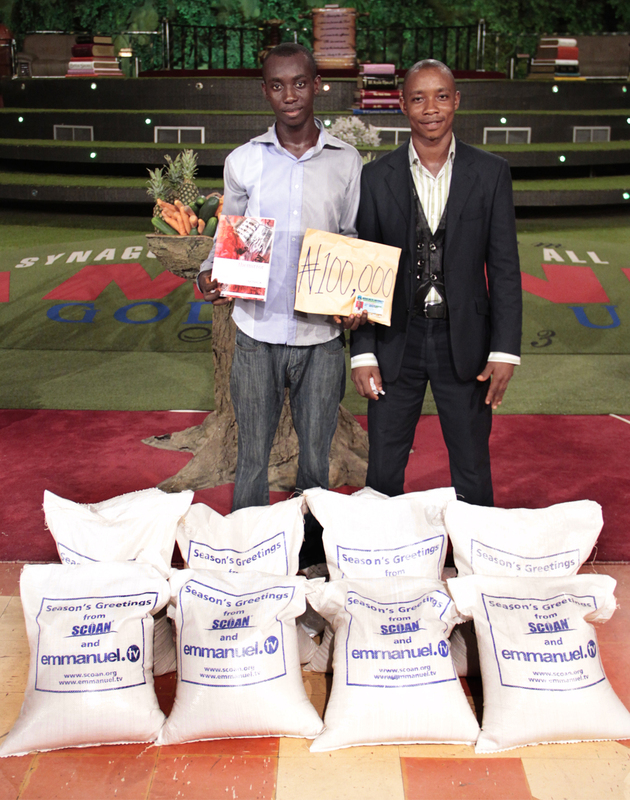 On behalf of Emmanuel TV and Partners, the prophet gave Emmanuel the sum of N200, 000.00, three bags of rice and a scholarship. A moving scene it was when a video clip of last Monday’s noon service was activated and revealed a young man currently a student of Niger Delta University, Wilberforce Island pleading with the man of God for financial assistance for his roommate, a 300 level student of Geology who had not been able to resume school in the session because of financial constraints. The roommate in question lost his father in 1994 and had been taking care of his education by his sole efforts. This session, he decided to abandon his studies as he never had the sum of N49,500.00 required to pay his school fees. His plan was to come to the school, pack his books and call it quits to university education. 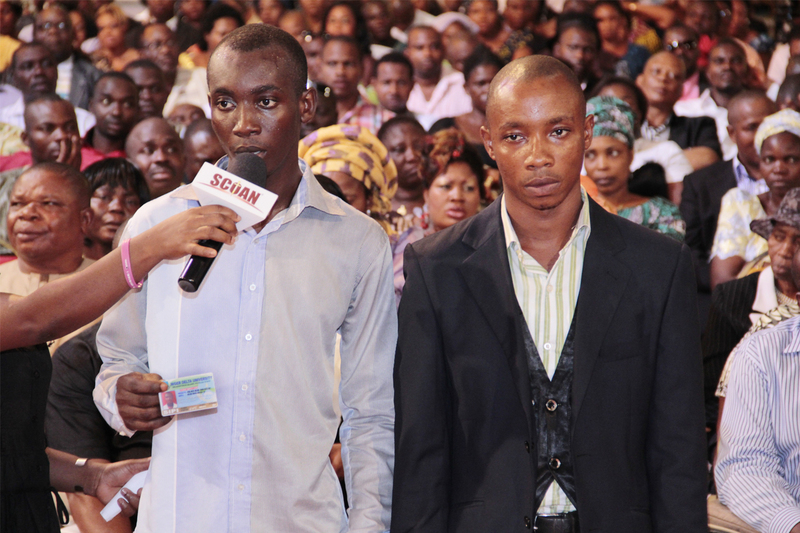 His roommate and friend, Sipi took it upon himself to bring him to The SCOAN where he cried to the man of God to have pity on his friend and render him all the financial assistance he needed to be able to resume studies. In his characteristic quick response to the call of the needy, the prophet gave Sipi’s friend twice the amount of money that he needed for registration this session when he released the sum of N100,000.00 and three bags of rice to him. 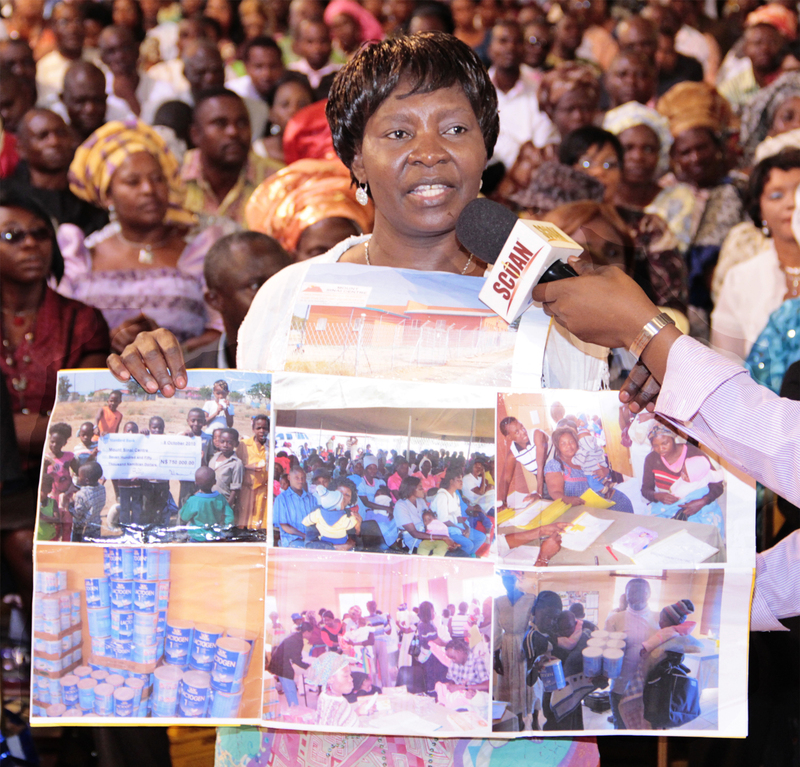 They both thanked God, the prophet and Emmanuel TV and Partners for the gesture. Mr John Okoh whose death sentence was commuted to life jail and then a miraculous release after spending 22 years in Calabar prison as told in The SCOAN’S Sunday service records of last Sunday also mounted the platform for blessing and reward by the man of God. Mr John who at 45 had spent half of his life in jail was given the sum of N200,000.00 and five bags of rice for which he thanked the man of God promising to spend the money judiciously as he goes to start a new life. 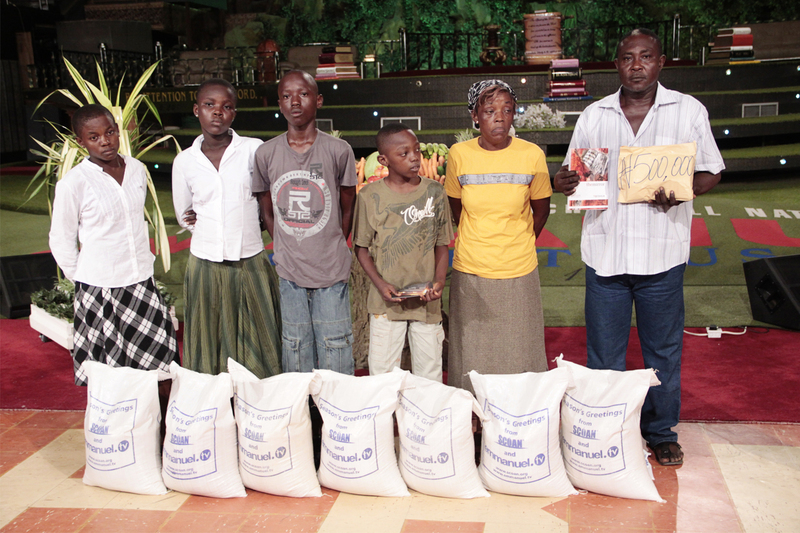 Another family that benefited from the church through The Emmanuel TV and Partners was that of Frank Odjugo. On Tuesday of the previous week about 8pm, his attention was drawn to two motor-cycles in flames by the storey building he stayed in. Unknown to him, it was the fire from the ground floor of the building that ignited the motor-cycles. 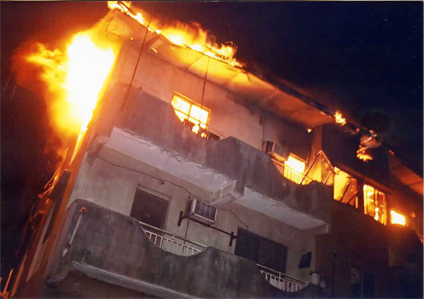 Before long, his children informed him of the inferno in the storey building and they rushed down to save their lives. The fire razed the building to the ground to render the family as a people without a roof over their heads. The man had to immediately look for a make -shift structure to shelter his family until he could recover sufficiently from the shock to plan his life again. 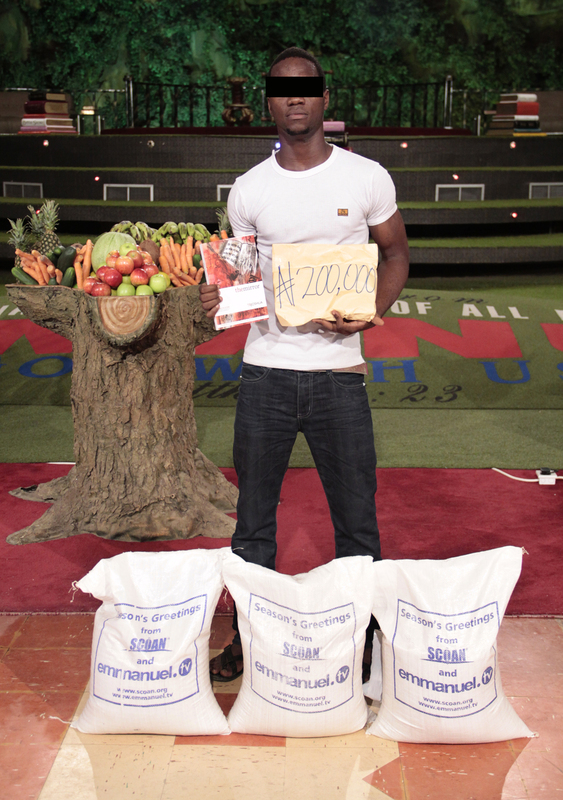 He received a cash gift of N500,000.00 and seven bags of rice from the prophet in the interim. The congregation was happy to learn about the continuation of the service on Monday noon where many of them hope to enjoy a closer interaction with the prophet. Attn Synagugue church of all Nation. May the name of the Lord be glorified, it is by Gods grace that we are witnessing these things today. And blessed is the eye that is able to see what God is doing in our world today. It is unfortunate that most people do not believe this. How much I wich them to beleive!. Thank you Man of God, the wise men and the Emmanuel TV team. Please, can I come for the anointed water? I am waiting for your reply granting my request. God bless you all. I give God all the glory for his mercy and favor upon my life and the ministry.I had a vision several times with prophet tb Joshua instructing me to come Nigeria to see him personally,so i came from ghana to nigeria but i couldn’t meet him on-one-on-one and fortunately for me,we met in the spirit and also i was one of those from other country.so i got my impartation when the man of God was laying hands on us,right now the grace of on my life has increase in different level.pls send my greetings to KEMI and Bose(ng)for their kind gesture,God bless u all. God has been using water from the NOAH up to our age. In Noah age he used water to destroy ungodly world and to lift up (save) godly people. in the hand of Moses God used red sea water to save ISREAL and destroy faro, in the hand of Elisha he used to heal the commander of the army from leprosy(which was not possible to the king of ISREAL), in the hand john the batiste God used water for repentance , in the hand of JESUS CHRIST to heal blind man and to show his first miracles ( changing water to win), to baptize believers in the name of father, son and holy spirit ,to express the holly sprit (spring water) and his words(wash by the word) and lastly in our age God is using water for deliverance and healing. We will also expect in the future to have the river of water of life in the New Jerusalem. The future water is not in bottle but in river. Praise the lord. So it has biblical ground to give anointed water. Remember JESUS starts his miracle by water. It is not the water that bring solution to all life problems but the mighty name that is called on the water that brig the miracles. The water is anointed by the name of Jesus Christ. We thank the lord using you to manifest his miracles through water. Can I get information how to get this new anointed water? PLEASE. Goodday Iwish to kwow how to get the annointed water from scoan. 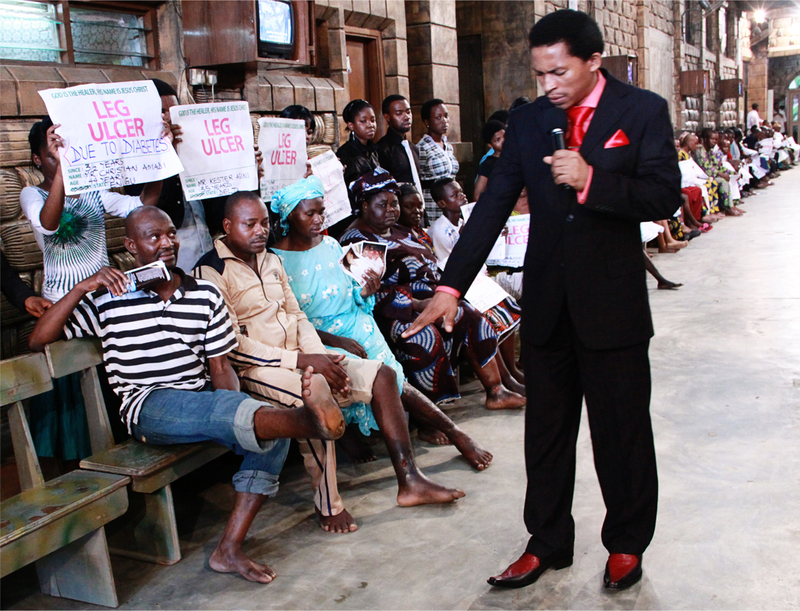 I thank God for using Prophet TB Joshua to restore lives. God bless you all members of Scoan and humble wise men. I’m just greatful for Emmanuel TV which interduced me to the man of God Prophet T.B. Joshua whom through him, the God is shining the light on my beloved Africa, which Known as a black continent. Praise the Lord. Amen. Emmanuel! Iam always be blessed with sunday servbice through Emmanuel TV!! Stay blessed. I dedicate all my life to Jesus Christ. Amen. Prophet Joshua, i am trying to start a ministry in Worcester, Mass. United states of America, kindly pray for me for God’s direction and guidance concerning this work. Another thing i would like to know is how do i get the anointed water. Please send me the code to log in on my tv. May the good God Continue blessing you, tb Joshua and emmanuel partners and add more years so as to win more souls in jesus name Amen. May the almighty god bless the SCOAN and give them many more years of a life of abundance so we could continue to get the anointing of God through them.Special greetings to all the wise men. God is great i always thank you our lord and saviour Jesus Christ to have anointed man like T B Joshua . I am appealing to Zambians or Nigerians any one with anointed water contact me on this number please 0977656830 we suppose help each other. Blessed be the name of the Almighty God our Lord Jesus Christ. This is the fulfillment of the prophecy by our Lord Jesus Christ saying in my name; they shall cast out devils, hear the sick and many more miracles that were not even performed by our Lord Jesus Christ. Jesus does everything that mankind will need in his day to day life, just believing is the connection. I say so, because am also a living miracle testimony. I have seen the work of God work in my late Father’s life as well as mine not withstanding the miracles that we see every Sunday at Emmanuel.tv. God Jehovah our Lord Jesus Christ, continue blessing the life of your Prophet, T.B Joshua. Its not easy to live the life of the prophet, you and I need God’s grace, which is a rare gift and God’s own purposed so that you and I might be saved. Jesus has to become the savior to save us through a few predestined God fearing men who our Lord uses to preach the good news with power confirmed by the Holy Spirit. Each generation has got its own kind at God’s own right time. 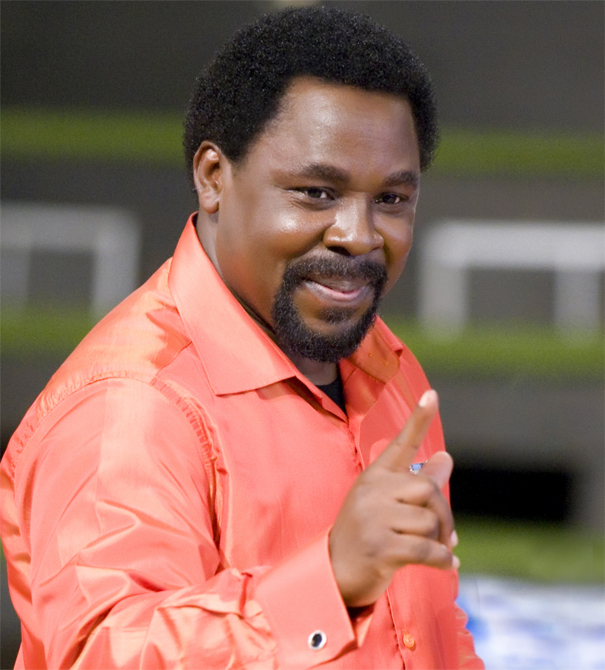 We thank God for the Prophet, T.B Joshua. My humble request, if possible, and I know with God all things are possible, what are the requirements or channels that can enable people like us from as far as Zambia obtain the new Anointed Water, if God wills. Man of God, I will really need one at God’s own time. God bless you, man of God, in Jesus’ name. Amen. Real this is wonderful! never seen. God bless you Man of God! This is Awesome Prophet. My prayer is to meet with the man of God by the special Grace of God. May God continue to increse in you. God richly bless you Prophet. Prophet please help us to be bless from the Anointing Water and the hand band we need it. I can be a contact person for that please let me know how to go about it i will be very greatful Sir. Thank you Prophet for making me know you. I thank God for you Prophet TB Joshua and your entire SCOAN family.Am so blessed whenevr i watch you live programmes and any other programmes on Emmanuel TV. And my plea today concerns the annointing water and the annointed wrist band. How can i have access to these amazing and wonderous gifts from above? Thank you in advance for your considerartion. Anyone here knows how to order the anointed water. I am from India and want to spread the power of God here through the blessed water. may god help me get a joy. Thanks so much for the new anointing water which is more powerfull than the new anointing water. May Glory be to God as we hold the truth to Gods word. Man of God thank you for doing the will of our father in Heaven. It is amazing, whenever I watch Emmanuel TV i give thanks to for what is doing in SCOAN. Man of God, remember Tanzanians. Emmanuel !!!! To God be the glory. I greet you man of God in the name of our Lord Jesus. I thank God for your life and for what God is using you to reach out to the needy and those that desire God’s word. I am a new convert into the life of Jesus Christ and wish to be strengthened in the works of God. I humbly request for your prayers and also request for the new anointing water. My mobile phone number is 00260961110511. I thank you in advance for your kind consideration. May the Almighty God richly bless you and make your ministry prosperous. I thank my God!! Who is Lord over all. I am blessed to see, and that seeing and hearing has bless millions. It is the fullfilling of God’s word. Jesus said to Nathanel because I saw you under the fig tree, believest thou? thou shalt see greater things than these. Verily, verily, I say unto you, hereafter ye shall see heaven open, and the angels of God accending and descending upon the Son of man John 1:50-52. I watch Emmanuel tv on a daily basis.What I see is amazing and actually my life is fast getting transformed because of Emmanuel tv. I am a believer for the last 15 years but what I see in Emmanuel tv has made me feel that i know very little about my God and saviour. The annointing water is a wonder working media which God of Joshua has decided to use for His children to get miracles without sweat. Is there any possibility for people who are not there at the SCOAN to get the annointing water? May God continue to Bless the man of God Prophet T B. Joshua, the Wisemen,and all the SCOAN team that they continue helping the world till Jesus returns. My wish is to have the new anointing water. Im prepared to pay DHL for the service. Im diabetic and believe if i get hold of it my prblem will be over. How do i get about it. Please respond via my e mail address. Im in Zimbabwe and desperate. My humble request is to have annointing water and wristband, will pay for the service. Deliver me from unclean spirits. I dedicate my life to Jesus Christ. I would like to thank the man of god for all the good things he is doing. Am in soth africa and please where can i get the annoited water. Can someone help ? I would like to thank the man of god for all the good things he is doing. Am in south africa and please where can i get the annoiting water. Can someone help ? thank God for thr prohet and the wisemen. Blessed be the name of the Almighty God our Lord Jesus Christ. thank God 4 the great things and blessings i have obtained through emmanuela tv. One day my spirit was down, I was hurt so when arrive home I opened emmanuel tv I just heard the voice of Prophet TB Joshua and my spirit was revived I had peace in my heart. THANK YOU MAN OF GOD, KEEPON OBEYING GOD, I LOVE YOU SO MUCH. I must confess that the anointing water is a General Purpose Machine Gun (GPMG) that strikes all the problems in ones life. Mine Has worked 4 me. Blessed be the name of the Lord.What else does we need to believe as The Man of GOD always remind us of the Love of JESUS for the nation.May you keep up the work in progress as the the HOLY SPIRIT lead you. Immanuel in the name of JESUS!!! May the Lord keep energizing the spirit of TB. JOSHUA, God create him for a greater purpose in life.May the Lord also open the eyes for those who are in the darkness and humble them to the truth. May he also he streghthern our faith everyday. we need more people in the world with FAITH. How can I order the Anointing water for diabetes healing. BLESSED MAN OF GOD TODAY IS THE 1ST DAY I WATCH YOU LIFE FROM MY PC @ WORK AND I’M SO GREATEFULL. I’M NOW READING THE DELIEVERANCE THROUGH THE ANNOINTING AWTER, IF POSSIBLE CAN YOU PLEASE SEND IT TO ME TOO. MY POSTAL ADDRESS IS PO. BOX 8198, NARRAVILLE,WALVIS BAY, NAMIBIA. MAY GOD BLESS YOU MORE IN JESUS’ NAME, I LOVE YOU AND THANK YOU. GOD IS GOOD ALL THE TIME. Emmauel i would to thanks the whole crew of scoan with they hospitality i’ve been visited the Synagogue from 23/02/12 – 29/02/12 i still need prayes from you God people i went there with high hopes that God would say something about my situation because of things has happend in my life and my family i even took 3 days dry fasting while i was still there. Now im filling dizzy and hopeless and its like my life is still standing were it was before im still praying and fasting i need your strong prayes and i believe in power of God who he ve trusted you with. L greatly appreciate how God is using Prophet TB Joshua,l am requesting for Annointing water and Wristbands.l believe God we use you to make my life better and . A REVIVAL CRUSADE HERE IN BOTSWANA. I thank God Almighty because of Prophet T.B Joshua who has today reached me through anointing water brought to me by Mrs Enala Mazangwira of Bell.T Tranport. I am what God says I am, I can do what God says I can do and I have what God says I have. My past is over in Jesus name. Glory be to God. I am happy I have known T.B.Joshua the servant of the most High God. you have to go to the church and ask them to give you the water or ask to pray for you on prayer line. To God be the glory! !What drives one to asked for the anointing water if you don’t believe as some of us did? May the name of Jesus be praised through the Prophet!! Thank you Jesus for delivery our brothers and sisters, I also need deliverance man of God, my feet appear swollen during summer, and sometimes blood comes out of my mouth, the condition that I don’t understand. Pray for my healing man of God. Thanks be to God the almighty our creator. I thank you for TB Josua. I am looking forward to go to SCOAN by the will and power of God, I need TB Josua to pray for me and my family, for God’s Blessing and protection. Pray for our new nation Republic of South Sudan, we are celebrating our first independence on 9th July 2012. Glory be to God for the blessings and wonderous he is doing through the Wise Mans of God. Humbly request for the new annointing oil for the blocked tubes that cause me not to conceive on my lovely marriage. I am willing to give a donation and give postage costs if needs be. Your assistance on this matter is greatly appreciated. Can Prophet TB Joshua please come or send one of the wise mans to South Africa in East London for a crusade. The prophet T.B Joshua should not be taken as an ordinary man He is a vessel containing a soul of one of the great masters nobody can destroy Him but one can become like him if you are a great soul like him. To be a great soul is not a life time development To be a lawer you must attend a law school, to be a great soul you must pass through evolutions so it is better to learn from Him than to go against Him, As one may be playing with fire. Thanks. I really need the SCOAN ‘s Anointing Water , I had one but it’s finish now, please God help me to get one for myself again. Man of God , God will bless you double in Jesus Name Amen ! We are are all looking forward to having the New Anointing water. but my belief is one day our prayers will be answered! BELIEVER ALL OVER THE WORLD!! Thousands have received a touch from heaven either through visiting the ministry of TB Joshua or through watching Emmanuel TV. Don’t keep it to yourself! DISTANCE IS NOT A BARRIER!